Would you believe that the helmet-covered face of Star Wars villainy has abandonment issues? French psychologists have analyzed the behavior of Darth Vader and determined that he may be suffering from borderline personality disorder (BPD). He hits six out of nine criteria for the disorder, only needing to meet five to be diagnosed. The psychs noticed that Vader "displays patterns of instability and impulsivity," cluing them in that he may have issues. For instance, his back and forth with "idealizing and devaluing Jedi mentors" during his youth, sometimes respecting Obi-Wan Kenobi and at other times wishing he would take a hike. He also exhibits problems with abandonment, dissociative episodes, and identity issues. He betrayed the Jedi and his friends to attempt to prevent his wife's death. He annihilated a camp of Tusken Raiders though he knew it was not necessarily the correct action for a Jedi. And simply moving over to the dark side and changing his name to Darth Vader is the "ultimate sign of such identity disturbance," noted the psychs. Let's be real here: Even the researchers admit that the emperor's influence probably had an effect on Anakin Skywalker's behavior, though they say it may have only inflamed the symptoms of BPD. 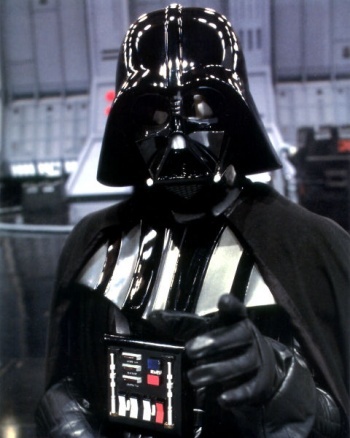 They compare the emperor to something like a drug dealer: "Using the dark side of the Force could be considered as similar to drug use: It feels really good when you use it, it alters your consciousness and you know you shouldn't do it," said psychiatrist Eric Bui. The researchers are using their analysis of Darth Vader as an example to spread awareness. Bui also believes that "psychotherapy would have helped Anakin and might have prevented him from turning to the dark side." If only his medical plan had allowed him to afford it.